Do you have a fantastic product or service you want to share? Partner with me here at Homestead Honey. 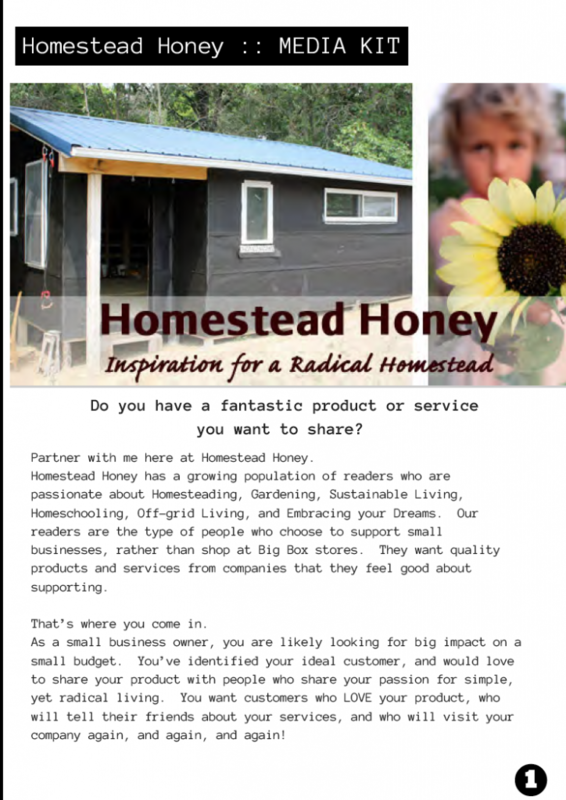 Homestead Honey has a growing and engaged population of readers who are passionate about Homesteading, Gardening, Sustainable Living, Organic, Whole Foods, Waldorf Education, Natural Building, Off-grid Living, and Living your Dreams, powerfully. Our readers are the type of people who choose to support small businesses, rather than shop at Big Box stores. They want quality products and services from companies that they feel good about supporting. As a small business owner, you are likely looking for big impact on a small budget. You’ve identified your ideal customer, and would love to share your product with people who share your passion for simple, yet radical living. You want customers who LOVE your product, who will tell their friends about your services, and who will visit your company again, and again, and again! Homestead Honey’s sponsorship program puts YOU, the small business owner, in the spotlight. When you place a 125 x 125 pixel sidebar ad, we amplify your reach by highlighting your product or service in the following ways. • Spotlight your business, along with our other sponsors, at the beginning of each month. This spotlight consists of a short paragraph that describes your company, with a link to your website or store. • With 6 month sponsorship commitments, we will host a giveaway of a product of your choice. Giveaways are a fantastic way to generate buzz about your product or service. We also offer the opportunity for an interview or discount code to accompany your giveaway. Ready to learn more? Click the image below to read my full media kit. Please fill out the form below, and I’ll contact you within a few days.